Have you been to the Orange Future Self micro site yet? I have and this is what I saw. 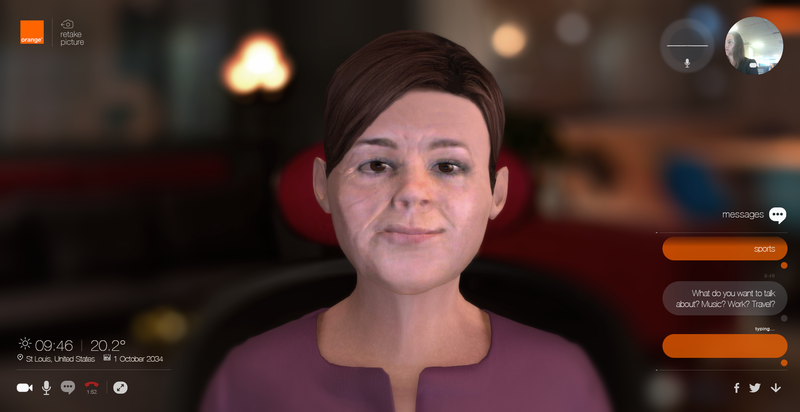 For Orange’s 20th anniversary, the European telecom company uses some futuristic technology to take your photo via webcam, scan your facial features, and then serve up an avatar you can talk to via microphone or chat widget, all with the aim of giving you a little optimism about the future. I first stumbled upon it via DigiDay and while it’s an incredible user experience, I didn’t learn a single thing about Orange, and there was no call to action to interact with the company any farther. My biggest takeaway? Invest in some moisturizer today, for a brighter future tomorrow.